I thought our story of following God from a Mayan village in the highlands of Guatemala to a tiny Vermont church ended the day, ten years later, when we left the ministry and moved to the South. It had been a great venture requiring the courage to let go of the things we held dear (like personal safety and income), but the Lord had done great and mighty things to show us there was nothing we could do to out give Him. However, the story was not over. It wanted to be told. And in little ways no less marvelous than the spectacular ones, the Lord provided opportunity after opportunity for me to achieve that sought after dream of every writer--a published book. 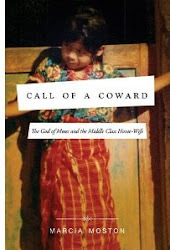 In March, 2010, Call of a Coward won the Women of Faith/WestBow Presss writing contest. (YouTube interview). I was happy enough to hold my first copy, but imagine my surprise a few months later when I received an offer for a contract from Thomas Nelson. I had no idea they were even looking at it. That's one of the delightful things about God, He's full of unexpected possibilities. Even in the story, there's a story! On a journey that leads from the highlands of Guatemala to a small Vermont village, Marcia follows God’s call for her husband even though it seems to conflict with her own dreams, requires credentials she lacks, comfort she fears to give up, and courage she doesn’t feel she has. Written with humor and insight, Call of a Coward is a candid account of a modern-day seeker and a very real God who makes cowards courageous, ordinary lives purposeful, and dried-up dreams fruitful.